Last week, Barry Frost released Micropublish, a Micropub client written in Ruby. It's a very slick interface for posting a few kinds of posts. I noticed that his "category" field looked really nice, and discovered that he was using a Bootstrap plugin called "Token Field". Today I added this plugin to Quill, so now everywhere that you previously had to enter tags as comma-separated values, it's now using this "token field" UI. 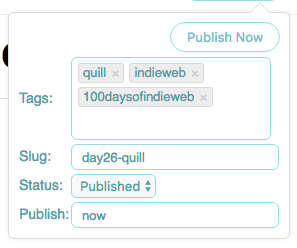 I also added a new field to the editor to set the published date of posts. Released last week? Oh. I guess I’ve been using the “unreleased” version. Now it has edit/delete/undelete functionality! That’s very nice. I kept the original version at https://micropublish.herokuapp.com for backwards compatibility for you. Does the new version work well for Sweetroll?